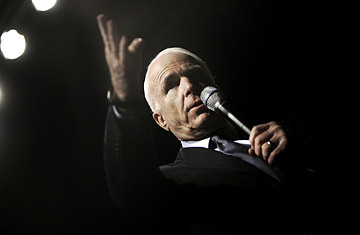 John McCain answers a question during a campaign event at Fresno State in Fresno, Calif., Monday, June 23, 2008. Back on the campaign trail late last year, amid snowdrifts and ice storms, candidate Tom Tancredo spoke often about the possibility of defecting from the Republican Party if its eventual nominee failed to meet his benchmarks of conservatism, most importantly a zero-tolerance policy for undocumented immigrants. "I am absolutely tired and sick and tired of being forced to go to the polls and say I'm going to make this choice between the lesser of two evils," the Colorado congressman said at an October debate in Michigan, standing across the stage from his ideological opponent, John McCain, who supports a pathway to citizenship for illegal immigrants. "I really don't intend to do that again." But just months later, with Washington sweltering in humidity, the hawkish immigration reformer, who wants to deport the nation's 12 million illegal immigrants, has declared his support for McCain. "I expect to be supporting him in November," Tancredo told TIME last week. "But certainly it is not set in stone." In other words, he still holds out hope of pressuring McCain to shift his positions on immigration, or at least not moderate them, by threatening to resort to the kind of public criticism that could erode the Republican base in key states. On Tuesday, Tancredo shot off a warning flare of sorts in the form of a public letter calling on McCain to clarify his position on immigration reform. "Maybe it's just wishful thinking on my part," Tancredo said in an inteview. "I guess I am holding out hope that when he says he 'got the message,' that means something." Tancredo is not the only one unclear about McCain's immigration position after the contentious primary campaign, in which the issue regularly polled as the second most important among likely Republcian voters, next to the Iraq war. "I will tell you, there is some confusion right now, some need for clarity," says Janet Murguía, the president of the National Council of La Raza, a Latino advocacy group. "There are some folks in our country who are confused about exactly where he is." For months, that confusion has been somewhat intentional on the part of the McCain campaign. It was the issue of immigration, after all, that almost sunk McCain's candidacy back in the summer of 2007, when the Senate debated and defeated a comprehensive immigration bill that was dubbed the McCain-Kennedy bill and derided as an "amnesty bill" by opponents. After the defeat, McCain's public rhetoric on the issue changed significantly, even as his actual position only altered slightly. "I got the message," he told Republican crowds hundreds of times in the early voting states. "We will secure the borders first." But in public comments, McCain often delivered a somewhat mixed message of his own. He continued to favor all the parts of his comprehensive plan  border security, increased employer sanctions for illegal hiring and a path to citizenship for the undocumented  but he mostly refrained from using the word "comprehensive." Instead, he spoke of a two-stage solution. First, he would secure the borders, a process that would be certified by border state governors. Then he would push for a process to allow the 12 million undocumented immigrants to become full citizens. More recently, however, McCain has switched back to his earlier rhetoric on the issue. In late May, he took time at an event in California to point out that he had worked with Sen. Ted Kennedy on the immigration bill. "We must enact comprehensive immigration reform, and we must make it a top agenda item," he said. A couple of weeks later, McCain released the first ads of his general election campaign  for Spanish-language radio in Nevada and New Mexico. This week, he plans to travel to Colombia and Mexico, to burnish his credentials as a leader who understands Latin America. Next month, he will address La Raza at its annual conference in San Diego, along with Democrat Barack Obama. The reason is not hard to fathom. McCain's campaign has already announced that it expects to do well among Hispanic voters, especially in key states like New Mexico, Colorado and Nevada. (President Bush won about 40% of the Hispanic vote in 2004, though most public polls now show McCain getting just under 30% of the same group, compared with 60% for Obama.) McCain aides openly talk about how the immigration issue that was a burden for their candidate in the primary could become an asset in the general election. And that is exactly the kind of talk that concerns Tancredo, who has announced that he will be leaving Congress after this term to try to clamp down on illegal immigration at the state and local level. He plans to continue to warn McCain, raising the dark specter of Republicans failing to show up at the polls in November. "It's awfully shaky," Tancredo says of the Republican base. "That's why I think it is disastrous to do something that gets into the 'comprehensive' approach." As of now, however, Tancredo's talk is just that. And the fact that an immigration hardliner like Tancredo plans to pull the lever for McCain suggests that the Republican immigration backlash he threatens may not materialize this fall.